Bunnies and the occasional deer or owl or hawk: That happens. We’re used to that. But last year, a family of skunks moved in somewhere nearby and began running across the field behind the condos in the early evening. One evening, I saw a bunny on a drive that goes back there; the family of skunks came running his way, and he freaked and took off. Nobody likes skunks. 😛 Not aggressive, but stinky creatures. The skunks may have been living in a new hole under our back stoop. Whoever lived there was evicted and the hole filled in. But now a skunk has moved into a hole underneath our front stoop, and we can smell it every night when it wakes up. Its skunk-bomb fills the air in the basement and sometimes drifts upstairs. Blech! At first, I thought a possum lived there, because I looked outside that day and saw a big possum running across the field in broad daylight. Also not something I’m used to seeing around here. We tried blocking the hole with netting after sunset, because that’s supposed to keep a possum from going back in, though whatever’s inside can still get out. But when hubby put the netting in place, he turned and saw a skunk run to the hole and throw aside the netting, then run in. Not sure how it can fit into that hole, but it obviously does. Sigh….Evicting a skunk does not sound like fun. Especially if it’s a mother ready to give birth/with kits. Those don’t leave easily. We also have a huge bunny who lives around here, probably a mother because of the two baby bunnies now wandering around. They are adorable, but they keep going after my garden. Something keeps eating my milkweed out back before it has a chance to benefit any monarch butterflies. I put up a little fence, but it still got through. Maybe the skunk did it. 😛 The garden in our little yard has chicken wire around it to protect the lilies, which bunnies find delicious. But some of the plants are poking through the wire, so the bunnies and their mother keep going after them. So last night I saw both baby bunnies going after those plants. I went out there, expecting my presence to chase them away. But no. I went up close to them, and still they just stood/sat there and looked at me. I could have reached over and petted them, which I wanted to do, but of course it’s a bad idea to pet a wild animal. But finally they slipped under the fence, probably to come back later when I wasn’t looking. I like living on the edge of town (though some businesses and sports fields have been popping up around here in the last ten or so years, making more traffic and blocking the view of the Ledge. >:( ). I like seeing what wildlife comes through here. 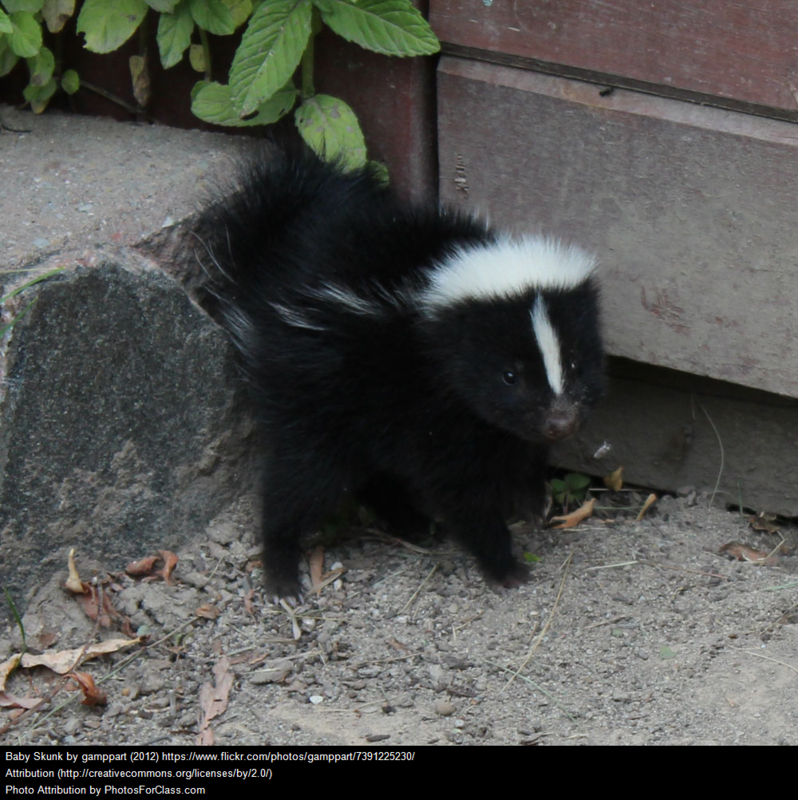 But skunks–They’re cool to watch as they scamper across the field out back, and even kinda cute, but no fun to have living under your house.